This evening Kathryn told me a story. I say a story because it was obviously a work of fiction – she had been duped by a joke on the radio about how fish get a bad press due to their name – FISH – and it’s because of this that we’re quite happy to eat them. She can be a little naive and I told her that it was obvious someone was winding her up and I went online to prove it. When your name can also be used as a verb that means driving a hook through your head, it’s time for a serious image makeover. And who could possibly want to put a hook through a sea kitten? Basically the gist of the entire thing is that eating fish is cruel and if they were called sea kittens nobody would eat them. Quite frankly if Garfield tasted as nice with chips as your average peice of cod I’d happily eat him too. I really do dispair sometimes at how stupid people can be (in this case I don’t mean Kathryn). Hello! First post of 2009 albeit 9 days in. I’ve been off work since 28th November following my ankle op and I’ve not been back to work since. Turned out to be a lot more complicated than originally thought and I had quite of lot of work done in there. 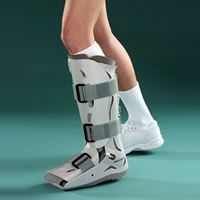 However I’m walking now albeit with the help of a boot that looks like something robocop would were (sans gun in leg). Still not allowed to drive though – Kathryn has been having great fun being designated driver – especially over Christmas. On the subject of Christmas, despite being imobile, it was very enjoyable this year and we had some presents we really liked – Kathryn got an Ipod Touch, a Nespresso coffee machine and Rock Band for the PS3. She loves them all. Among other things I got a Garmin Forerunner 405 (a gps watch for running and cycling) and a turbo trainer (for converting a bike into an exercise bike) so I’m wondering if people are trying to tell me something?! We also got a Tefal Actifry which might not sound too impressive but it makes great chips! We never used to have chips so it’s a real treat. I’d have chips 5 times a week but Kathryn doesn’t approve. Also had a pile of games but for some reason I’ve not played all of them yet despite my mass of spare time – have played Call of Duty Modern Warfare a lot though – really is a great game seeing as I don’t normally enjoy FPS games – the quality and cinematic feel of the game is excellent. I’m struggling at the moment with the online play – I think I get killed about 5x for every kill I get. I’ll try to blog more often (yeah, yeah, heard it all before) this year and provide things of more interest – we’re working out this years holiday plans at the moment so that always provides good blog fodder.